How To Get More Engagement On LinkedIn? LinkedIn is one of the best social media platforms and it is really powerful if you use it right. Here’s the problem. Trying to be active and engaging on LinkedIn is very challenging. For starters, LinkedIn is not really a platform for socializing. It is all about being professional and doing what it takes to network with others. So, how do you become a champion on LinkedIn and get more engagement? The content you share on LinkedIn matters a lot. In this case, be mindful of what you are sharing because you should be sharing content that resonates with your potential audience on LinkedIn. Instead of using all types of content and see what sticks, consider thinking a few steps ahead and throw tough questions on yourself such as the type of content that will interest you. Chances are the content that interests you will most probably interest your intended audience as well. Most of the time, we share content based on “me” and “I”. Consider using LinkedIn to promote others and not entirely about yourself. This gives you better opportunity to create a portfolio that is positive and more engaging. At times, a simple post wishing your peers “Good morning” goes way further than any other forms of content. Should you be self-promoting on LinkedIn? Absolutely yes, but make sure you do it once in a blue moon. Unless you had acquired $30 million worth of funding from VC, it is best to keep self-promotion to yourself. This is simple and yet, often being overlooked by others. Engagement with others plays an important role especially when you want them to engage with you! Here’s the thing. The first step of ice breaking is always challenging and it can go down really odd. Being an introvert myself, I find it really hard to make the first move and I rather keep quiet than speaking out my thought. if you ever have this problem, consider using Mel Robbins’s 5-second rule. Basically, you need to count down from 5 to 1 (yes, backward) and then take action after reaching 1. Counting backward gives you the opportunity to think differently and taking action allows you to immediately take action without giving yourself the opportunity to consider what would go wrong. In this case, take action to make the first move on LinkedIn. After all, what is the worst thing that can happen, right? Ladies and gentlemen, without proper control, your mind is going to play tricks on you. While the mind is hot-wired to protect us, it is also the biggest downfall for us because it can easily make us doubt ourselves. People will not connect with you if you do not provide value to them. Always remember, others will think what’s in for them if they connect with you. Give them a reason (or reasons) to connect with you. There is no connection that worth nothing (unless with a telemarketer) or some sort. Each connection you make must be treated like gold because it matters a lot to you. 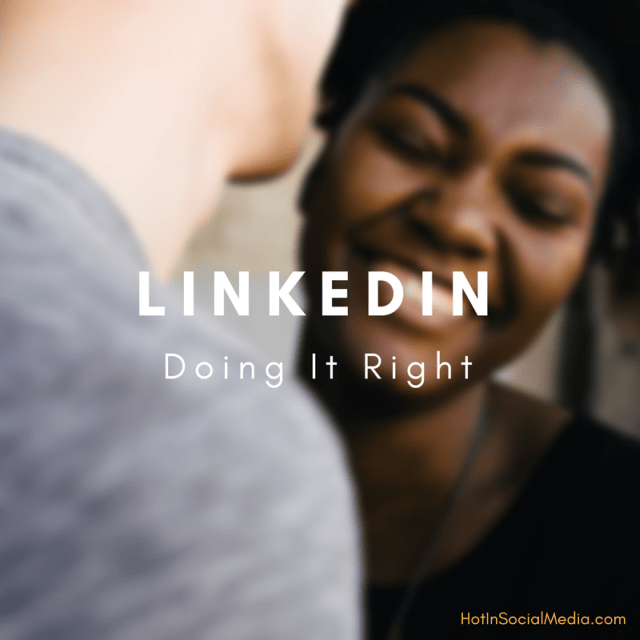 Having the right mindset about connection is going to bring you more success on LinkedIn than any other platform could do for you. Regardless you are a consultant, freelance or even an employee of a company, connection plays a significant role in your success. Understand that connection is beyond vital and it is your job to get it done correctly. LinkedIn is just like any other social media platforms in the world. LinkedIn never sleeps but we certainly do. Using third party social media tools can help you be more productive on LinkedIn, as well as the ability to engage with others even when you are asleep. All of the tools above allow you to schedule posts and some of them even allow you to monitor conversations on LinkedIn. This gives you powerful insights and with this information, you can start sharing content that matters most to the right audience! LinkedIn Premium pricing starts from $29.90 per month and trusts me, it is one of the best investments if you want to build stronger bonds with others. For starters, LinkedIn InMail allows you to reach out and communicate with others who are NOT within your network. With proper strategy, you can easily use this to create conversation and expand your network. At the same time, LinkedIn Premium allows you to make your profile more visible and others are able to connect with you because you are able to showcase more information than what others are. As a result, you will have more views on your profile, as well as more opportunities to create the first great impression. LinkedIn Premium allows you to discover people who had seen your profile in the past. And that’s how you can connect with these new people and build your network! I’ve been using LinkedIn heavily the past few months and trust me, it is often time more powerful than Facebook and Twitter. It gives me more opportunity to network with others within my industry and at the same time, portray my skills and knowledge to grow my ‘value’ in the industry. What do you think? Leave a comment and let’s discuss!